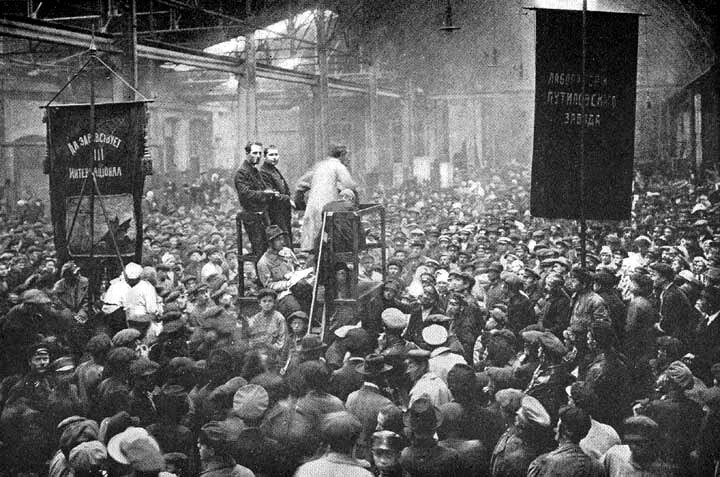 Many Russian anarchists were totally opposed to the institutionalisation of the Red Guards, fighting units that had been created by factory workers in the course of the February and October Revolutions. Indeed Rex A. Wade in his book on the Red Guards points to the strong anarchist input and influence in the Red Guards in the initial phase of the Revolution. Relations between the anarchists and the Bolsheviks had started to deteriorate after the October Revolution, and anarchist delegates to the 2nd Congress of Soviets in December 1917 accused Lenin and his party of red militarism, and that the commissars were only in power at the point of a bayonet. As a result in Moscow, Petrograd and other main centres they made a concerted attempt to set up free fighting units that they called the Black Guard. In 1917 detachments of Black Guards had been set up in the Ukraine, including by Makhno. Nikolai Zhelnesnyakov had to flee Petrograd after the Bolsheviks attempted to arrest him and set up a large group of the Black Guard in the Ukraine. Other Black Guard detachments operating in the Ukraine were led by Mokrousov, Garin with his armoured train, Anatolii Zhelesnyakov, the younger brother of Nikolai, and the detachment led by Seidel and Zhelyabov which defended Odessa and Nikolaev. Another Black Guard detachment was led by Mikhail Chernyak, later active in the Makhnovist counterintelligence. In the Vyborg district of Petrograd, anarchist workers at the Russian Renault factory set up a Black Guard but it soon merged with a Red Guard that had been created at the factory at the same time. The Moscow Federation had already seized 26 houses which had been the mansions of the rich, and they used these as bases. Some of these houses were strategically placed in the city. They were furnished with machine gun nests, had dormitories, libraries, lecture halls, arsenals and stockpiles of food. “Because of its power and influence the Federation succeeded in sequestering the premises of the “Kupechesky Club” (The Merchant’s Club) located at the Malaya Dmitrovka, an enormous and magnificent house, luxuriously decorated and having a library and theatre. The seized premises were renamed into “Dom Anarchia” – “Home of Anarchy”; proving to be well suited for the most extensive and varied Anarchist activity. By that time the Federation entered into agreement with one of the largest Moscow printing shops, enabling it to start issuing a daily instead of their former weekly paper. By March, 1918, the Federation became a large organization in point of numbers. Apart from the work carried on outside of the “Dom Anarchia”, there was also extensive activity going on within the newly acquired headquarters. Frequent and well attended lectures and mass meetings were held in the Theatre Hall of the “Dom Anarchia”. A library and reading room were organized on the premises, circles of proletarian art-printing, poetry and theatre, were set up and numerous other activities of the same kind were launched. The activities of the MFAG had intensified after the Soviet of Ministers moved to Moscow. In the ranks of the MFAG worked the Gordin brothers, Apollon Karelin, Vladimir Barmash, M. Krupenin, Piotr Arshinov, and Kazimir Kovalevich. The registrar MFAG was one of the theoreticians of the movement Lev Chorny. Immediately after the October coup the MFAG brought out its paper Anarkhiia on a daily basis. Urging the masses to deepen and develop the revolution. In April 1918 in Moscow there were already more than 50 groups and detachments of the Black Guard, numbering some 2,000 militants, the most famous being: Hurricane, Vanguard, Autonomy, Immediate socialists, Twister, Lava, The Tempest, Strugglers, Petrel, Anarcho-syndicalists, Brotherhood, Student Party and the Latvian anarchist detachment Lesma (Flame). From a KGB report we know that a Samara anarchist detachment had also arrived in the city. All groups and organisational units of the Black Guard were grouped around the Council of the MFAG and headquarters of the Black Guard, stationed in the House of Anarchy in Malaya Dmitrovka. There was a secretariat of the Federation, the propaganda department and the editorial board of Anarkhiia. According to the Cheka, anarchists were planning an insurrection scheduled for April 18th and therefore it was decided to make a preemptive attack, disarming the troops of the Black Guard. The allegation of such a planned insurrection was always strenuously denied by the anarchists. A general assembly of the MFAG was planned for the 14th but this was all. As a result, on the night of 11th to 12th April the Cheka convened an emergency meeting, set up a headquarters directed by Dzerzhinsky and began operations to disarm the armed detachments of the anarchists. Dzerzhinsky was to remark: “We had certain information that the leaders want to take counter-criminal elements grouped around a group of the Federation, to act against the Soviet power” (Izvestia № 75,16th April, 1918). Already on 8th April the commandant of the Kremlin P. Malkov and commander of the Latvian mercenaries E. Berzins had conducted reconnaissance to determine the strength of the MFAG forces. A plan was approved was approved to eliminate the “anarchist counter-revolution”. The operation involved military units of the Cheka, (the 1st machinegun detachment) and the 4th Latvian regiment of riflemen, as well as part of the Moscow garrison. Operations began at midnight with the anarchist houses surrounded by these troops. Many of the anarchist units lacked combat experience and endurance but the Bolsheviks met fierce armed resistance in some places, for example, in Malaya Dmitrovka at the House of Anarchy. Here the Black Guard occupied surrounding houses and put a light artillery piece on the roof. The Chekists stormed the building, backed up by artillery fire that destroyed the light artillery piece and the first floor of the building. However the Chekists were only able to take the building after being reinforced by the Latvian riflemen.The last stronghold of the Black Guard was the Zeitlin mansion which was taken by 12 noon, and in general fighting between the forces of the Cheka and the anarchists stopped by 2pm. As a result of this operation, the Bolsheviks killed 40 anarchists, some shot on the spot, whilst 10 to 12 Chekists and soldiers died in the fighting. The veteran anarchist Mikhail Khodounov was murdered by the Cheka and his body dumped in the street. This operation served as a signal for the sacking of the libertarian organisations in nearly all the important cities of Russia. And as always the provincial authorities exceeded in zeal those in the capital. Leon Trotsky, who for two weeks had prepared the blow, and who had carried out in person, among the regiments, an unbridled agitation against the “anarcho-bandits”, had the satisfaction of being able to make his famous declaration: “At last the Soviet government, with an iron broom, has rid Russia of Anarchism” (p.308, 1974 edition). Indeed Trotsky had addressed units of the Red Army with anti-anarchist speeches, whipping them up into a state of frenzy. After the defeat of the Black Guard in Moscow, 500 anarchists were arrested (some were released soon after). The Samara anarchist detachment, which had taken an active role in the defence of the anarchist clubs, was expelled from the city. Events in Moscow signalled the beginning of repression in the provinces. Similar attacks were carried out in Petrograd, Vologda, Smolensk, Briansk and so on. In the early morning of April 12th in Gorodets in Nizhny Novgorod province anarchists, led by the chairman of the city Soviet Morev fought back against Bolshevik attacks. In Kursk, anarchists mutinied and held the town between the 10th-29th April 1918. On May 9th the Commissariat of Internal Affairs sent a directive to all Provincial Soviets: “The experience of Moscow, Petrograd and other cities has shown that, under the flag of the anarchists are hidden hooligans, thieves, robbers and counter-revolutionaries, secretly preparing to overthrow the Soviet power … All the anarchist guards and organisations of anarchists to be disarmed. No-one e can have a weapon except with the permission of local soviets” (Izvestia № 91, 10th May 1918 ). However, on May 17th anarchists allied with maximalists rose in revolt in Samara. The Black Guard was defeated, and was subsequently portrayed as a gang of criminals. A distinction was drawn, as we have seen, between “ideological anarchists” and “anarcho-bandits”. As Trotsky was to say: “They were simply marauders and burglars who compromised anarchism. Anarchism is an idea, although a false idea, but hooliganism is hooliganism and we have said to the anarchists: you must draw a clear line between yourselves and the burglars… the Soviet regime has taken power, not to pillage like highway brigands and burglars, but to introduce a discipline of common labour and an honest working life”. Thus a clear message was sent that the anarchists would be treated as common criminals. Trotsky was to continue to warn the anarchists: “If you want to live together with us on the basis of principles of a common discipline of labour, then you must submit to that of the labouring classes, but if you want to get in our way, do not blame us if the government of labour, the soviet power, deals with you without putting on gloves”. In other words, submit or prepare for repression. “The reception of the militants into the Black Guards is made on the recommendation of either: 1) local groups, 2) Three members of the Federation, and 3) the factory and workshop committees, 4) The District Soviets, daily, from 10 am to 2 pm in the premises of the House of Anarchy”. And in issue 22 it was stated that: “Comrades, who wish to enroll in the Black fighting squads, should be concerned with obtaining advice. Not having recommendations they may not be included in the lists of fighting squads. Headquarters”. It was made clear that the Black Guard would not carry out policing operations like the Red Guards (raids, arrests, etc) as this was the latter’s prerogative. As regards the requisitioning of houses, these must be the work of a special commission composed of delegates of local groups. The Secretariat of the MFAG asked the Black Guard HQ to provide a list of all its members on April 4th. On the other hand the Cheka and Red army units were able to arrest without being controlled by the Soviets, arbitrarily shooting people in their execution cellars after the death penalty had been abolished by the Soviet government. The action against the anarchists was not carried out by Red Guards or Red Army units, who would have refused to take part in these attacks, but by specialised units controlled by the Bolsheviks. It should also be noted that when the Red Guard units were hastily formed in 1917, they included criminals as well as German prisoners of war. Looting was carried out in Moscow in spring 1918 by Red Guard units and by the mandate of the Chekists, and if the Black Guard units were also not blameless, they had were not alone in this. It was significant that the evening of the attack on the Moscow anarchists Peters, the second in command in the Cheka, was to show the British diplomat Lockhart around the sacked anarchist houses to send a message to the Western powers that the Bolsheviks were the party of order and were able to control and harness the revolution. Noting a murdered anarchist woman lying on the floor of one of the mansions, shot through the neck by the Cheka, he referred to her as a prostitute. Skirda, A. (2000) Les anarchistes Russes, les soviets et la revolution de 1917. Paris. Latter-day sycophants of Bolshevism and 'left communism' should reply to this contribution. But nowadays, like chameleons, they shun 'sectarian' confrontations, to adopt a more convivial and sweet image. ICC racketeers and devotees in particular should post here to comment on these historic events, or return to the thread http://libcom.org/forums/history-culture/communist-left-internationalist-anarchism-13072010, where the claim is made that 'left communism' (and thus the Bolsheviks of Lenin-Trotsky) and 'internationalist anarchists' are really comrades-in-arms. A rah-rah boy of this racket even wrote ecstatically: Marxist and anarchist "communists" have been fighting shoulder to shoulder in various small or great class battles for long. This history of comradeship is very crucial and should never be forgotten. (post 4). But much more significant and decisive were these bloodlettings, unleashed by proletarian saviours such as Lenin, Dzerzhinkly, Uritsky, Latsis, Unszlicht, Peters and others, doubling as butchers. Both hats fitted them well. To these little experts in 'comradeship', exterminating 'internationalist anarchists' (plus other opponents and huge numbers of 'collaterals') in Russia from 1918 onwards was just another Bolshevik 'mistake', and nothing to do with the growing and murderous malignancy of Bolshevik state capitalism. Battlescarred's above contribution should help set the record straight. It also helps explain why red fascism (Rühle) is the only adequate definition of Bolshevism. 'hooliganism is hooliganism' some things never change! And overall, there are some mistakes in the article, e.g. Karelin's name was Apollon, not Alexander; the Renault Factory was not in the Finnish city of Vyborg but in Petrograd district called Vyborg Side. There were plenty of Finnish Red Guards in Vyborg (Viipuri) in 1917-1918 though. Of course, should have spotted that myself! D'oh.!!! are you okay to update the article?